Single/Continuous is equivalent to what is found on professional CD players. With Single On the focus stays on the same song in the Play Now list, without advancing to and start of the next song. This comes in handy for dance instructors so they can play the same song over and over again. With Repeat or Continuous the same song will be played in a loop, over and over again like auto repeat. Optionally with a delay. Delay before or after playing is partly based on Silence between songs. The difference is that the delay/silence is within the time-frame of the song. So when you press play the selected song will be played after the delay or the delay is added after the music ends before advancing to the next song. This way it can be combined with shuffle and Repeat. The delay before is very handy for dance instructors as this gives them time to walk over to the dance floor. Its identical to a timer for a camera shot, giving you time to take place in front of the camera. The delay time and Before/After is settable from the toolbar. Click on an icon and the status will be toggled. The delay time is also shown on the toolbar and can be set by the up and down icons. The Single On/Off icons are made by dalarath. Stop at title will stop the Play List when it hits a song called STOP HERE. 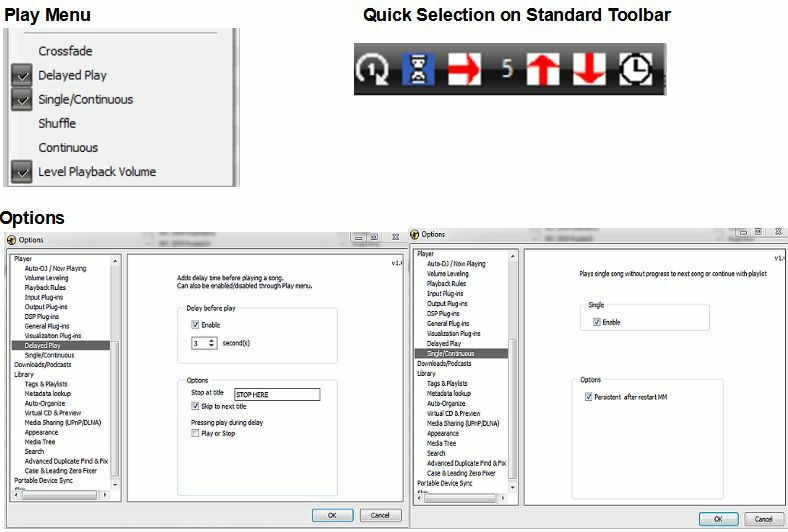 For convenience sake a MP3 file with 1 sec of silence is included, which will be placed in your personal Music directory during install. Otherwise extract it from the MMIP file. Pressing play during delay gives you the possibility to skip the delay and play or not play the song. Standard behavior is Single Off at each start of MM. Persistent will remember the setting after restart of MM. The first song in the Play Now list cannot be used with Single On. This is because MM advances automatically after each song ends. This is standard behavior of MM4 and as far as I know there is no way to circumvent this. With the output plugins from MM (DirectSound and WASAPI) the music sometimes doubles a second at the start of the song. This is related to the audio buffer and that the script isn't fast enough to stop the music after pressing play. I recommend to use WaveOutput instead. Download the script installation package below, then run the .mmip file to install it in MediaMonkey. Last edited by OnnoTabak on Tue Dec 15, 2015 11:01 am, edited 2 times in total. For easier install you can upload it on my MMIP hosting (HappyMonkeying) and have find updates functioning.